Hello! It's time for another JustRite Friday Challenge! This week's challenge (JRC_045) is called Celebrate Good Times.. make a Wedding, Holiday or any other Celebration project. Our generous sponsor this week is Flower Soft. Have you tried the Flower Soft Silver and Gold? I used both on my project today, and I love the texture and sparkle they add! 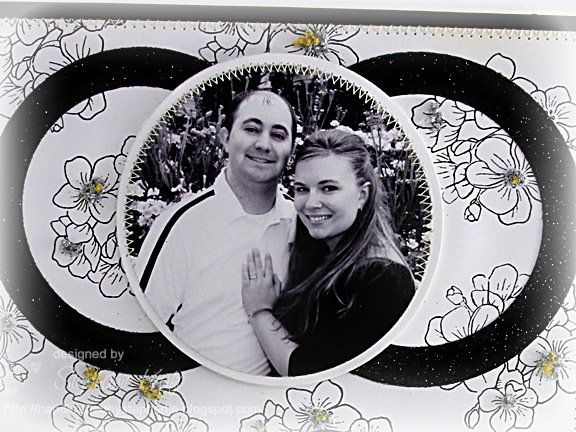 I made an 8" x 8" scrapbook page using an engagement photo of my sweet niece and her fiance (now her husband!) and framed it. Her wedding colors were black and white, so that was my starting point. I created my background paper by randomly stamping the cherry blossom image from JB-09705 My Garden Borders & Centers. I added a little bit of ink distressing to the edges of my cardstock and stitched it onto a black mat. Below is a close-up of the lower part of the layout. I used some silver ribbon, tied a bow and added a couple of stick pins through the knot. I stamped the frame (that fits Labels Fourteen Nestabilities perfectly) from CL-02055 In the Moonlight-Cling. 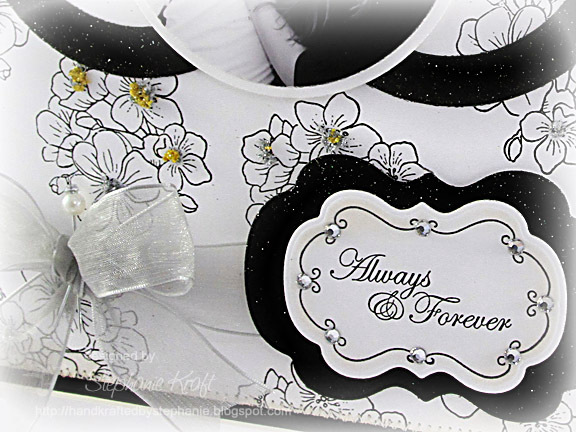 The sentiment, "Always & Forever" is from JB-09235 Weddings Nested Sentiments & Verse. Finally, I added a little ink and some Swarovski crystals around the sentiment frame. Accessories: Flower Soft - Silver and Gold, Frame (Michael's), Ribbon, Jenni Bowlin stick pins, Swarovski crystals, Foam tape, Thread, Sewing machine. Beautiful LO Stephanie! So classy and elegant! Love the touch of flower soft in the center of the flowers! Gorgeous layout! Love the black and white color scheme and the circles.